gasninja, DragonTeaHouse doesn't sell fakes. For this once, they're acting like Houde and letting the price age. I myself would not be interesting in '11 Jin Dayi, even at $65. I wouldn't be interested in the '07 An Xiang sheng for $65 either. Factory tea is factory tea is factory tea, and there's a world of difference between the '05 Dayi Mengsong Peacock (and earlier factory teas) and something like the An Xiang. I have an endless list of things at $65 I'd want more. Jin Dayi is a nice tea, but there is not really anything special or compelling about it other than that it tastes and feels nice. shah82 wrote: gasninja, DragonTeaHouse doesn't sell fakes. For this once, they're acting like Houde and letting the price age. I myself would not be interesting in '11 Jin Dayi, even at $65. I wouldn't be interested in the '07 An Xiang sheng for $65 either. Factory tea is factory tea is factory tea, and there's a world of difference between the '05 Dayi Mengsong Peacock (and earlier factory teas) and something like the An Xiang. I have an endless list of things at $65 I'd want more. Jin Dayi is a nice tea, but there is not really anything special or compelling about it other than that it tastes and feels nice. It doesn't have qi. It doesn't have aftertastes. What it does have is a relatively thick and round soup that tastes of sheng sweetness and fragrantly antique furniture. It doesn't really *do* anything during a session either. Being a pleasant tea is quite truly all that it is. It's good when you want to have a casual session, but it's not close to the best tea you can buy at that price. Location: on top of a mountain. The Zhou Yu Hong Yin has very little to do with the Jin Dayi. I would pay cash money $125 or whatever it was for that tea, if I had the money, in a way I wouldn't for ZiYin, ZiPin, and the other 2003 single area teas, never mind the '11 Jin Dayi. Moreover, my opinion of the '11 Jin Dayi isn't an especially isolated one. i actually had great faith in this statement of yours and went ahead to purchase 1 piece. by today, i've tested mine and other tea friend's 2011 gold dayi a few times to come to the conclusion that i'm never going to order from the vendor again. i don't fault the vendor's service really. he/she answers within the day and offered to refund me. however, the cost of shipping is 1/4 of the cost of this cake. if you search taobao, those fake looking ones has this line. the cake also came with torn security marking which the vendor cynically suggested the working of customs officer (package not even opened). I purchased a sample of this tea from DTH a while back and compared it to apache's tea, which I believe he purchased from a Dayi store (correct me if I'm wrong here apache). The teas seemed to be the same, other than noticeable differences which I attributed to different storage conditions. Since I did not buy a full cake, I am unable to comment on the line found on your cake, or whether this line appears on authentic cakes or not. Why don't you try to contact Dayi to confirm they produced no tea with that line. They must have a customer service email. If you don't read/write Chinese ask a teachat member who does to contact them. I am sure someone who reads Chinese would do this for you. Sometimes teacakes are made with differing wrappers between batches. I have seen it in a cake no one would fake. Did the security features "light up"? Taetea's website is also in English. You can contact them here. Why don't you send them a photo and learn for sure if that tea is a fake? Sure enough, mine too has the line. No broken seal, though. I haven't started on this cake yet, but it does smell exactly like the sample I received from DHT earlier (which made me buy the cake in the first place, at that time I didn't really know about all the hype surrounding it). 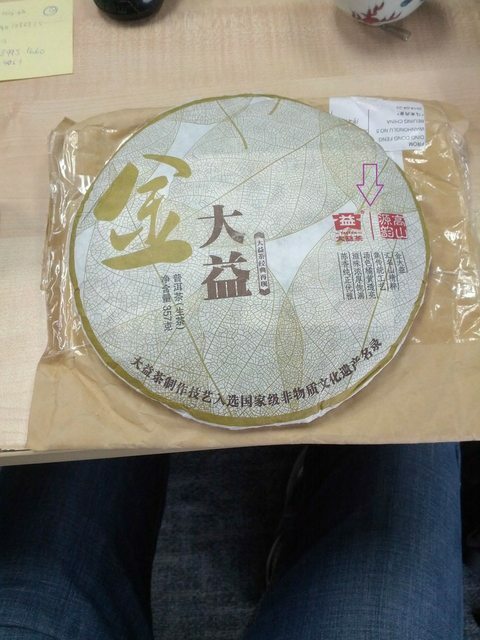 I would say, however, that if I was in the business of making fake puer I definitely wouldn't screw up something as easy as copying the wrapper. Why would forgers add something so conspicuous as this line if they wanted to pass it off as the real thing? That said, if you contacted Dayi please let us know if you receive an answer. It would be interesting to get to the bottom of this. Edit: Emailed Dayi myself... Let's see if there's an answer. Edit 2: Everytime I write Dayi my mind conjures up the image of (Lin) Daiyu, and I pronounce the name to myself, with strong emphasis on the tones. Like clockwork. Huh, it's strange that people who ordered from DTH in the last couple months got the line while mine doesn't have it and matches the pictures from hobbes, apache, dth, and other sources. I just checked my records and I bought my cakes February 1, 2013. Maybe there was a wrapper change in later cakes??? I'm interested to see what dayi says. IMHO, there is only one batch of 2011 GD, and it was manufacture on two separate days, 8th and 12th June 2011. I have both versions and I have yet to find one of mine has that vertical line. However, the same year Dayi Yiwu does have the similar vertical red line! Just find out that, that is an auction website, and this link is only good for a few days!. apache wrote: IMHO, there is only one batch of 2011 GD, and it was manufacture on two separate days, 8th and 12th June 2011. I have both versions and I have yet to find one of mine has that vertical line. Last edited by Exempt on Jun 6th 14 12:12 am, edited 1 time in total.